With their perfumed flowers Wisteria are a favourite old fashioned climbing plant or vine that have been popular in Australia for many years. The two main varieties for sale in Australia are Wisteria sinensis and Wisteria floribunda although others can also be found. A woody climbing vine originally from China, Asia and the USA they are a long lived plant. In fact in many areas of Australia the heavily scented lilac purple or white flowers have come to represent spring. Wisteria Floribunda ‘alba’ pictured right will reach around 9m, one of the best white flowering varieties with a spread of 5-6m if left unpruned and trained. Species and cultivars abound with W. floribunda ‘nishiki’, W. Sinensis ‘Blue Pacific’ and W.Macrostachya ‘clara mack’, the pale blue W. Floribunda Lawrence along with W. floribunda carnea as favourites. The main species include : W. Sinensis, W. Floribunda, W. Brachybotrys, and W. Macrostachya. 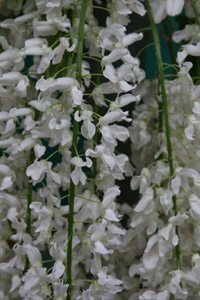 The rare white flowered form of Kentucky Wisteria, W. macrostachya clara mack with racemes 15-20 cm in late spring and the purple flowering W. floribunda Nishiki with its leaves mottled creamy-white are two standouts. 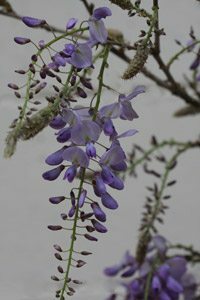 There are also pink flowering wisteria, W. floribunda carnea is a hardy species Wisteria are tough, fairly drought tolerant and can make interesting standards. Growing and pruning these wonderful climbers is fairly simple, they prefer a sunny position and a humus rich well drained soil. A cool root run is essential for growing wisteria, so mulch well or plant where the roots are in shade and the growing part of the plant reaches up to the sun. Do not allow wisteria to grow around verandah posts, other house structures or other plants, they are tough and will do damage. Train them to grow on wires instead. Try something different, espalier along wires on a fence, try standardising , they make a very interesting weeping plant. When do you prune Wisteria ? The time to prune wisteria is immediately after flowering. Wisteria plants flower before the foliage forms. Generally prune just after flowering before all of the new foliage develops. Remove long shoots, and prune back to 3-4 leaf nodes from the larger growing stems. Remember that these plants can be pruned as a standard or tree form as well as left to grow as a vine or climbing wisteria that we know so well. Wisteria Sinensis (pictured right) is the Chinese species, probably the most popular for most gardeners over the years. Generally this species will start to produce masses of flowers within 3-4 years of being planted. Wisteria can be grown in pots or containers, usually trained as a standard. As the root system is restricted growth is a little less vigorous although you will need to prune them twice to three times a year. You can purchase standardised plants or do the job yourself. You will need a good sized container and a study wooden stake. Plants can be trained around the stake until you get to the desired height. It is then a matter of being brutal with the pruning. All of the lower side shoots need to be removed. The top should be pruned back hard in winter to around 5 – 10 cm and in summer after flowering to around 20 – 30 cm. As you are trying to encourage flowers rather than leafy growth choose a low nitrogen high potash fertilizer.